I don't see any yet selling here. 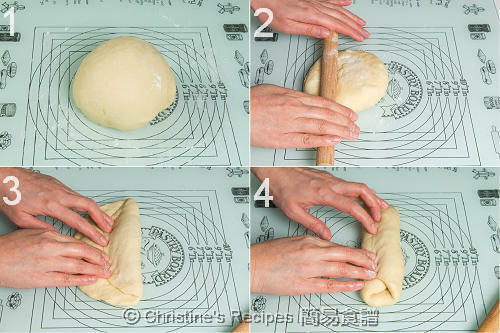 The ingredients in the main dough already minus off the ingredients for "tang zhong"? If I follow the recipe in the link to make "tang zhong", ie. 50g flour + 250 g water, how much is the yield of the "tang zhong" in gram? No, the ingredients in this recipe are just they are. You have to make some tangzhong beforehand. Normally, I use 50 grams of bread flour to cook with 250ml of water, then I get about 245 grams of tangzhong. It depends on how long you cook, how much water you lose in the cooking process. Not published on my English blog yet, will do it later. I used full cream milk powder to generate and increase fragrance. I'm afraid that CoffeeMate won't have enough fragrance you would like. I've tried making bread using your tang zhong method but still yield very dense cake like bread. I do hand-knead the dough. Perhaps I am not kneading long enough? Please take a look at this previous post. It might help. 3.食譜的份量為 2 份的話, 請問若先焗第一份, 另一份應怎樣保存, 以至不會過度發酵? Thank you so much for sharing your recipes! I love them! I just have a quick question. I am not sure what do you mean by 全蛋液 and 蛋汁? Thanks again for your help. 2.食譜的份量為 2 份的話, 請問若先焗第一份, 另一份應怎樣保存, 以至不會過度發酵? When I weigh the instant yeast, I found there's a great difference between freshly opened ones and the left-overs I started to use one week ago (I kept it sealed in the fridge and found it still worked yesterday, i.e. measured with a teaspoon, did not weigh.) But when I try to weigh it according to your receipt, I found it lost weight (could not get any measurement on the elec. scale!) Does it mean that some property is lost? If not, I think it's not because of the yeast you used. What kind of kitchen scale you use? Maybe the amount is too small, your kitchen scale can't measure properly. Use teaspoon for measuring then. Thank you very much for your reply! I will try using the teaspoon to measure. That means it will require nearly 4 teaspoons of instant dry yeast according to this receipt, right? 86 gram whipped egg = how many eggs? It looks really yummy. I plan to make it. What brand of your bread baker? Can I use stand mixer instead? Sure, you can use stand mixer if you like. My name is Rita. The last two comments are from me. I almost check your website every week. I love the bread section because I am a bread queen. I just ordered a sunbeam bread maker. Can you post more bread recipes? If you can separate a section for "bread baking", it is easy to search. I made the milk toast last week, but it's not very successful. However, my friends and kids love it so much. I will make bread often when my sunbeam comes. Hi Rita, thanks for your visit of my blog. Welcome you to come back for more. I'm a tangzhong bread lover, will post when I experiment something new and good. I love your blog. And your family members must be some luckiest people in the world, able to taste so many delicious dishes all the time. I got a question about the butter. What will happen if I take out the butter or decrease the amount. Will it decrease the softness of the bread? I am worry that too much butter is bad for our health. Thanks in advance! Thank you for your love of my blog. Yes, we're so blessed, thankfully. I think you can decrease the amount of butter. I forgot to add butter once, it's still soft, but a bit dry and without the fragrance. The bread was still good to eat. 這個食譜我已試了兩次, 但每次都是外皮很硬硬燶燶的, 但裏面像還沒有熟似的... 還有整個麵包很重的 為什麼呢? 怎樣才是薄膜狀態呢?? 我是用麵包機整的 較上DOUGH SETTING, 然後跟著食譜的方法及時間去做... 麵團未焗之前很光滑的, 而且很有彈性似的的.. 因為我ROLL的時候它會縮圓! Love your blog! Thanks for sharing all your wonderful recipes! I tried your Hokkaido Milk Toast by my bread machine. It tastes good but it doesn't have the texture like yours. Is it the hand rolling of the dough making the texture difference? You mentioned the difference between instant yeast and active dry yeast in your other post. I want to ask you, are these two type of yeast inter-chargeable? I tried your other bread receipes and they turn out good. I really want to try your milk bread but I don't know the exact measurement in volumn, such as flour 540g equals to how many cups? I don't have a scale, so i need to use measurement cup. I wonder if you can put all the measurements in volumn in brackets so i can try out this receipe. For converting the measurements, please refer to this post I wrote previously. Hope it helps. 是否因為我用了 bake conv (風扇) 的關係?? ive tried this today, taste fantastic! thanks for the recipe! My pastry board was made by tempered glass, bought from a nearby nifty shop, no brand name on it. May I know which bread maker do u use? may i know can i just leave the breadmaker to complete the entire process include baking? You might. But the crust would be thicker and harder than those baked in oven. since my breadmaker the minimum size is 2lbs, can i just double up all your ingredients to get bigger size loaf? You could double all the ingredients and make a bigger loaf. I tried it last nite and found that the dough was quite wet. I need to add some flour finally. Is there any I make it wrong? 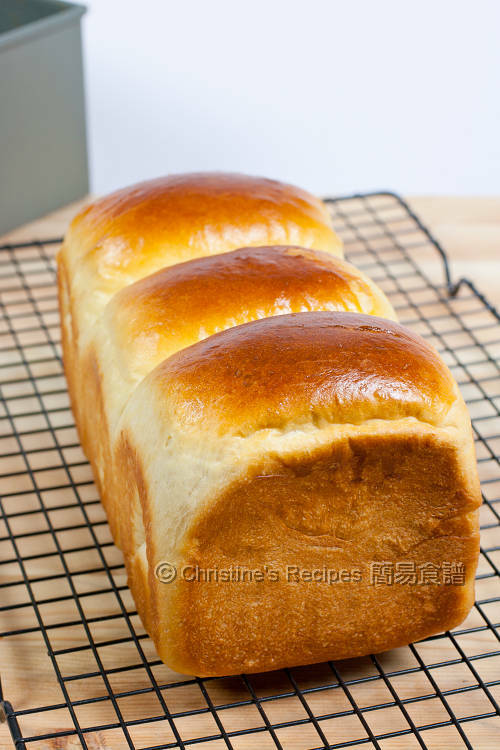 I finally tried this recipe today with my breadmaker, the texture looks lovely and it tastes quite good...as I live in the UK, it's not possible to get the Hokkaido milk so I only used regular semi skim one, but seems the taste of milk isnt strong enough, can you make some suggestions? Full cream milk is better. If you'd like stronger milk flavour, you could add more quality milk power. The original recipe calls for 天然牛奶香料 9克 to add more milk flavour. I have a question on bread flour, I don't know which one to buy at Woolworth, some of them say bread machine premix and with yeast, white, wholemeal and which one do you use to make bread? 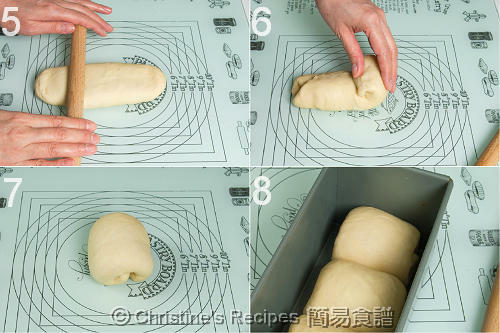 I often use Defiance, White Baker's Flour for making tangzhong breads. Please click to take a look at this picture. Both Coles and Woolworths stock them. Hi, my bread machine has a pre-set dough making program which allows the dough to rise twice upon finishing the course. Shall I just stop the program half way or allow it to complete then remove the dough & set aside for the third rise? P.S. Thank you Christine for your site. We C9s love it. Not quite sure about the setting of your bread maker. Basically, the bread dough needs only two rounds of proofing and one 15-minute rest between them. Don't ever over-proof any bread dough. If you want to shape your dough after the 15-minute rest and before the 2nd round of proofing, you need to remove it from your bread maker then. But if you bake a loaf, simply leave it inside and let the machine complete the whole process. Assume that you have already waited for the bread cooled down. It could be the moist inside the bread or the weather. Where and how did you keep your bread? 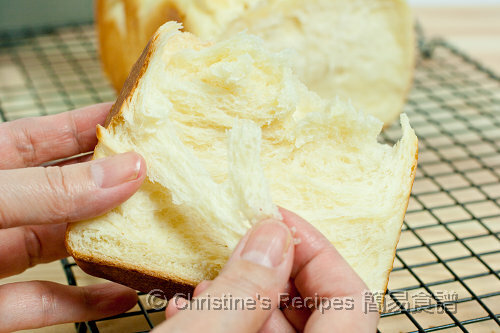 I often place the bread inside a plastic box, and place a kitchen paper underneath the bread that helps absorb moist. i did put the bread in a plastic box, but i never place a kitchen paper underneath, ll try again next, now i m in the midst waiting for my bacon n cheese bread out fr the oven, i lov ur recipes, really easy, i just try the ”港式焗猪扒饭“ v easy to prepare n my kids lov it much, ll try ur "牛肉串烧“ tomorrow, n ll let u know abt the result. btw not sure u receive my first comment or not it is regarding abt sugar, any substitute like brown sugar as my parents are also bread lover, but they prefer less sugar bread, if you ve any idea pls let know, thanks a lot!!! Not sure which comment you're referring to. Was that one on Bacon and Cheese Bread recipe. If so, I've replied it already. Please hop over there to have a look. tis is Elaine, thx for ur reply. would like to check with you, whether can reduce the sugar in the bread (any bread) or substitute with brown sugar? this is mainly for my parents, coz they take less sugar. ll the reduced of the sugar affect the whole bread? well abt my bacon n cheese, i think i know y i said the bread is moist, it looks moist coz of the cheese melt, i used mozarella cheese for this bread, the texture is good when it comes out fr the oven, however the next morning the melted part of the cheese in the bread turna lit bit hard, this really affected the whole bread, any advise on it? wat type of cheese u use for tis recipe? You can skip the sugar if you like. Breads can be made without any sugar at all. It could affect the taste but not the texture as much. Concerning the cheese, I normally use mozarella, cheddar or supermarket brands. Hi I would like to ask what will be the taste and texture if I don't put whipping cream. Also can this reciepe be baked using the baking machine until the whole loaf finished? If I don't add whipping cream, need any change to the quantity of other ingredients? Also if I only put fresh milk instead of milk powder, need any change to the other ingredients too? The whipping cream will add more milky flavour to the bread. You can replace it with milk. If you don't have milk powder, just skip it. It's fine. You can bake the loaf in the machine. But the crust tends to be thicker and harder, compared to those baked from oven. The taste is still good. I am from NY, I was wonder can I use light cream or heavy cream instead of whipping cream, because I do not know what is whipping cream called in New York. Light cream and heavy cream are whipping cream. Light cream is good for this recipe. Hello!Could you tell me which size are most like your 面包盒模具.Please.I really want to buy 面包盒模具try to make one like your. Hello! !just wondering that if i dont use a breadmaker, could i use dough hook on my hand mixer to do the dough part instead? If your electric mixer is designed to knead dough, you can try. Hi Christine! Thanks for the recipe! I have a sunbeam bread maker and I'm just wonder if u can bake the bread in the bread maker instead. If so should I choose 1.5 lb or 2 lb loaf? You might use your bread maker to bake your loaf. Please note that the crust will be thicker and harder than those from oven. 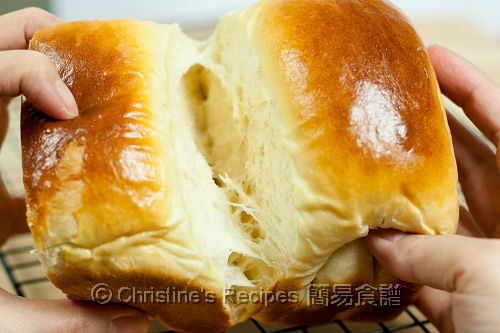 請問Christine，instant yeast 同 instant dry yeast係咪一樣?